I only got three guesses on Saturday's Guess The Gun post. Of the three, SciFi Jim correctly ID'ed it as a Mauser, but Paul was the one that narrowed it down to a Mauser Broomhandle! Congrats, Paul! Full disclosure: I actually wrote the post Friday afternoon at work, and not having the C96 with me, "borrowed" a pic of the rear sight to stand in for mine. So, Mike, thanks for noticing the fingerprint, but neither it nor the sight belong to me! So, let's take a look at the whole thing, shall we?? 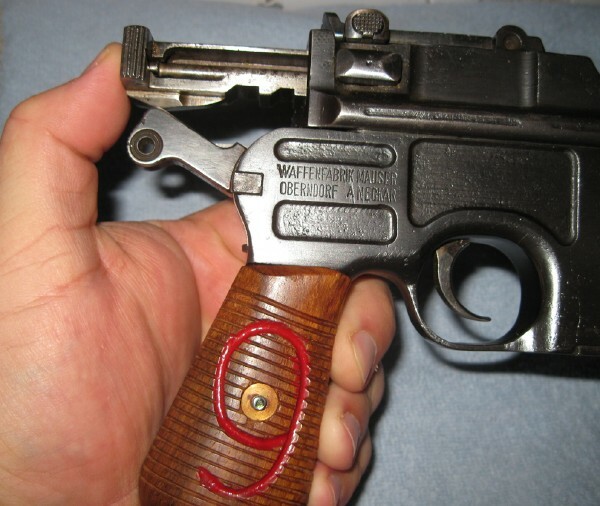 I had an opportunity to acquire a "Red 9" version of the Mauser C96 chambered for 9mm Parabellum, and wasted no time doing so. 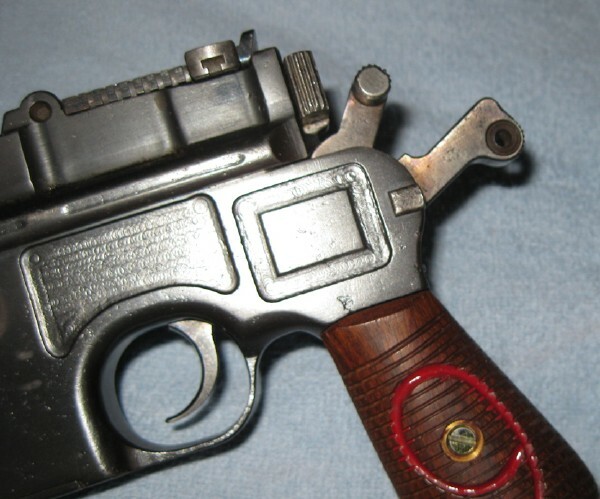 This particular version was made circa 1916 for the Prussian Army, as a stopgap measure to provide pistols for the troops when the Luger P08 was in short supply. The "Red 9" refers to the large red numeral 9 burned and painted into the grip to distinguish it from the typical Mauser C96, which fires a bottleneck 7.63 cartridge. Red 9's are rarer, tend to appreciate in value quicker, and it's not nearly the PITA to get ammo for as a 7.63 version is. It's a handful! With the 10-round magazine on front of the trigger and the long barrel, it's not a compact or balanced pistol by any means! Here's something I didn't know: With the hammer back & the safety on, you can carry a Broomhandle cocked & locked! Also, with a round chambered and the hammer down, the safety, when engaged, will lift the hammer up off the firing pin. You can see clearly the wartime tool marks on the frame. To feed the thing, you need to acquire stripper clips. I got some from Numrich. Ugly & rusty, but they'll work. 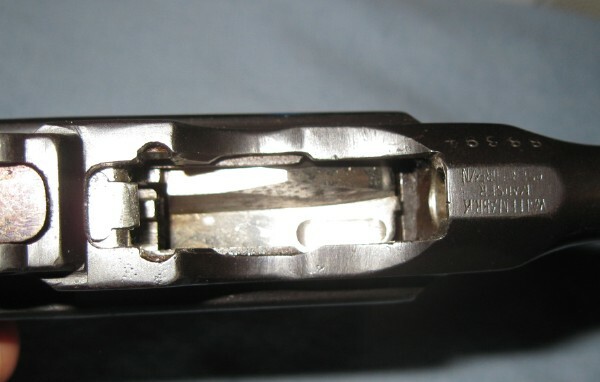 With 10 rounds of 9mm lined up in the clip, you insert the stripper into the slot, and shove the rounds into the internal magazine. Upon removing the stripper clip, BE CAREFUL!!! At that point the bolt will slam forward, chambering a round, the hammer is back and you are HOT!! Ease the hammer back a skosh and apply the safety, or carefully lower the hammer and apply the safety. Remember, this was made back in the days where "Is Gun. Is Dangerous." was commonly understood! 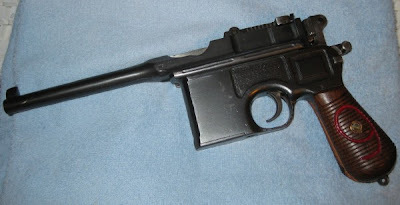 I'd love for this to have a hammer-dropping safety, but that didn't show up until the P38 entered production! Here's the bolt in the rearward position. 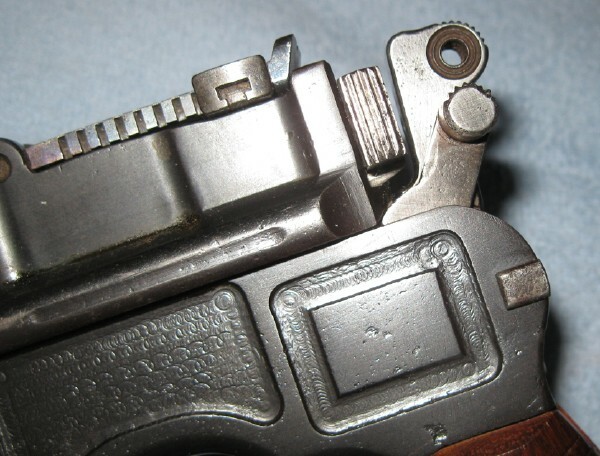 You can see the firing pin in the slot on the bolt. The screw seen holding the grip on is the only screw on the entire pistol. Everything fits together like a Chinese puzzle box. It's not hard to break down and reassemble, but you do need to pay attention. Put it back together it wrong, and you can lock it up tight, requiring you to do some damage to unfuck it and get it put together correctly. Stick to the field strip as opposed to a detail strip, and you should be OK! I can't wait to get this to the range!